Hi, my name is Bart Buie. I am a general contractor in North Carolina. My construction company, Built by Design, LLC , builds new homes and some commercial projects. That is my full time job. I have been making these puzzles in my spare time and it is something I really enjoy doing. I have been encouraged by many friends to sell them. That is why you have found this web site. Mr. Stewart Coffin made a living designing and making puzzles for thirty years. Who knows, making puzzles may become more profitable than building new homes (at least it is not as risky). All of the puzzles are handmade by me one at a time. As I mentioned before on the welcome page, I do not have a large inventory; therefore, most of the puzzles are made to order. I am not into mass production but "quality production". I strive to make the very best products with the best woods available. Building things out of wood has been a passion of mine ever since I can remember. As a child I preferred taking my toys apart rather than playing with them. This fascination for how things work still intrigues me. I have found that these puzzles combine these two fascinations. I wish I was smart enough to design these puzzles but I have only reproduced (with permission) some of the designs by Stewart Coffin. I first saw Mr. Coffin's puzzles in an article in Fine Wood Working Nov/Dec 1984 (in fact I still have that same issue). The Jupiter puzzle (pictured below) mesmerized me. To think that it was possible to build a shape that actually came apart and went back together. At the time I was in college and did not have the tools (or experience for that matter) to try and build them. I had always been interested in woodworking and had been working for my uncle doing interior trim work since I was in high school. That is what lead me to general contracting. 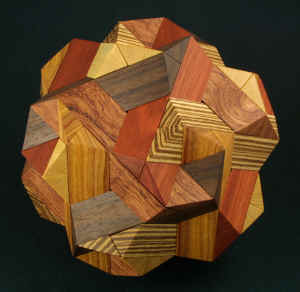 Many years have passed since I first saw that article but I never forgot those “Nifty Wooden puzzles”. In the fall of 2000, I was searching on the internet and found John Rausch’s web site Puzzle World. It is there where I was able to print Stewart Coffin's books and information on how to produce the “APART-ART”. I started “attempting” to build some of the puzzles in November of 2000. The first wooden puzzle I “attempted” to build was the diagonal burr (the one with 6 pieces, 3 w/2 notches, 2 w/3 notches & 1 pseudo key). I have about 15 or 16 Diagonal Burrs with notches were too big and, would not stay together. I did stick with it however. I worked on my techniques on producing consistent stock (“stick”) and tweaked my jigs. I finally got it worked out and was able to produce a satisfactory puzzle. One thing has lead to another and here you see the results. With the help of Mr. Coffin I have been able to finally make the Jupiter puzzle, the one that started it all back in 1984. Click here to see the Jupiter product information.